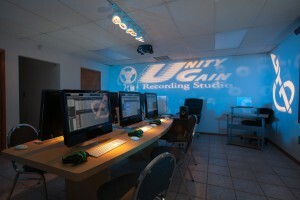 Unity Gain Recording Institute offers two, one year audio recording programs. The Audio Recording Comprehensive Program is the first and is also a pre-requisite for the second program, Advanced Techniques in Audio Recording. This level of the school's curriculum explains the expected duties of an audio engineer. Topics this quarter cover the necessary physics of sound, microphones, console components, patchbay networks, and the multitrack recorder. Each student will take part in the recording of an artist utilizing all concepts learned at this level. Understanding digital recording and editing techniques is essential in today's multi-track studios. MIDI level students work first hand with sequencers, synthesizers and samplers. Computer languages, automation, notation editing and virtual recording are among the topics covered. All students participate in recording three sessions practicing all of the above. Upon completion of all four levels, each student will receive a Diploma recognized by the Florida State Board of Education. Unity Gain Recording Institute offers each graduate the opportunity to continually participate in recording sessions after program completion to maintain record, edit and mix skills learned. This allows each graduate to add to their audio resume in preparation for employment. Click Here for Advanced Techniques in Audio Recording our second year program information. Click Here for Logic Pro X program information. Any student who successfully completes the three previous levels will be accepted in to the Audio Recording Workshop. Each week, a different musical group will record for a class-conducted session. Each students is assigned a specific duty during each session. Students are supervised by an instructor, who will answer questions and help the session flow. This completely hands-on approach solidifies the techniques studied throughout the year. The intricacies and complexities of the subjects covered in LEVEL 1 are explored. In addition, equalization, special effects, noise reduction systems and multitrack recorder alignment procedures are covered extensively. All students again participate in a multitrack recording session utilizing all the concepts acquired from both levels.